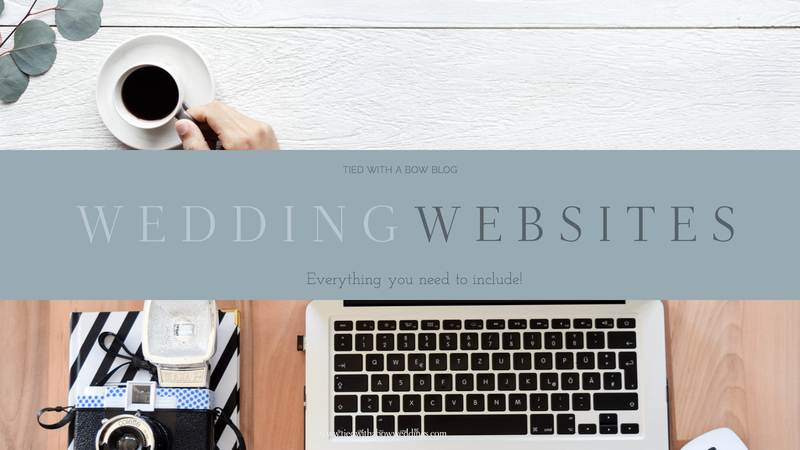 Blog Everything you need to include in your wedding website! Everything you need to include in your wedding website! In today’s web-centric world, it is a great idea to create a website for your wedding. A great wedding website will convey the important information your guests need to enjoy your wedding day to the fullest. When it comes to making these sites, you don’t want to have too much or too little information. After my vendor spotlight with Dana Nicole Designs, I thought it would be helpful to further explain the information you should include in your wedding website. So if you want to create a fabulous wedding website, I have you covered! Your Love Story: Don’t be surprised if you end up inviting people to your wedding that you have never met. Typically, a parent’s best friend, or colleague will get the invite and doesn’t know you and your fiancé. Take the opportunity to share how you met, your favorite hobbies, or how he popped the question! Photos: You want your wedding website to be undeniably yours. Many people get engagement photos taken and don’t know where to display them. If you want to extend your photos’ reach past social media, this is the place to do it! Personality: Whether you are having a beach, rustic, boho, or classic wedding, infuse your theme into your wedding website. Using similar color palettes and imagery will help to create a consistent aesthetic from the website to the altar. Important Details: You want to think of your wedding website as an extension of your invitation suite. Provide links to Google maps, hotel booking blocks, and transportation services to assist your guests. Be sure to include important dates (RSVP deadline) and the schedule of your day. This can be something for guests to use if they forget your invitation en route to your o wedding. Guest Activities: If you are having a wedding with lots of out of town guests, this is a great idea! Make a list of fun activities, shopping and great places to eat in the area. Your guests will really appreciate the effort you made to make sure their trip full of excitement. Bridal Entourage: Give some love to the people that are helping you get to the wedding day. Including a little information on your bridesmaids and groomsmen will help guests have familiar faces in the crowd and appreciate your bride tribe more. Contact Information: This is important for out of town guests that might have delayed flights or get lost en route. Provide your preferred method of contact (consider creating a wedding email specific to your day) and a contact person for the day of your wedding. Psst! This is why you may want to create a password protected site! Wedding Registry Information: Many couples are choosing unconventional ways for guests to help them start their lives together. If you are looking for cash wedding gifts to contribute to honeymoons and down payments (check out Honeyfund.com), or the traditional gifts, a wedding website can help convey this information to your guests. It has long been a no-no to put this info on traditional invites, but most guests still want to gift you what you really need. Give the people what they want! The best part? You can link directly to your wedding registry website, which makes life easier for everyone. Fun Additions: Feel free to share some information on your honeymoon, or any fun activities you are planning for your day. Have fun with your wedding website think of it as great introduction and way to build excitement for your day! Remember, you can always ask for help when creating your site! If you don’t know what to include in your wedding website, we provide Colorado wedding website services in our full-service planning package, as well as an a la carte service offering!